Silberra Aphenol developer is a single-solution phenidone-ascorbic acid developer for black-and-white photo films. Silberra Aphenol developer works as an equalizing sharpening developer with very low graininess, good light sensitivity and no fog level; it provides wide and sharp gamma of halftones and works well on light areas of the negatives. Silberra Aphenol is perfect for processing modern dry-silver photo emulsions on T-grain crystals, but it is also fine while working with classic films. Sensitivity can be very easily increased up to 3-4 times, almost without loss in overall quality, what makes Silberra Aphenol a universal developer for push processing. Comes as a set of 3 reagents in 3 separate packs, meant to prepare 1 litre of working solution. Disodium edetate, sodium sulfite anhydrous, trisodium phosphate (dodecahydrate), potassium bromide, 1-Phenyl-3-pyrazolidone, ascorbic acid. 4) Pour contents of the pack #3 into the water while stirring until the powder is completely dissolved. Do not begin mixing the contents of pack #2 or pack #3 until pack #1 is completely dissolved. If any lumps of powder form in your solution, they can be broken down with your stirring stick. As soon as the working solution is ready (powders are totally dissolved), add cold water to make up to 1 litre and stir. It is desirable to let a freshly prepared working solution settle a few hours before use. The prepared solution may have a very faint lemon-yellow color and be slightly cloudy. Filtering the solution is not obligatory. Average development times for most photo films in freshly prepared SIlberra Aphenol Developer is between 7 and 8 minutes at 20C. Optimal time to process specific films is stated either by manufacturer of the film or can be learned from the table of developing times below. Silberra Aphenol working solution is recommended for one-time use. However, its effective usage limit for film is up to 10 films of 135 type per 1 litre or up to 5 films of 120 type per 1 litre; optimal developing time for each film processed after the first one must be increased by 10%. During storage the working solution that has been used may become cloudy and precipitate may settle at the bottom of the bottle. Precipitate doesn't affect any chemical qualities of the solution, but it's recommended to filter solution before next use. 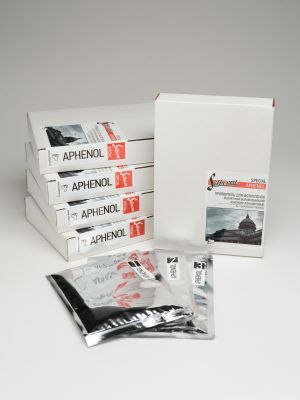 Keep Silberra Aphenol Developer in a cool, dry and dark place. Keep away from children. All the solutions shall be stored in tightly sealed bottles, with low air volume inside. Silberra Aphenol sealed powder packs can be stored up to 12 months past the production date; Silberra Aphenol Developer working solution can be stored in a closed bottle for 4 months past the production date, and, if used, no longer than 30 days after first use.